Japanese clothing company Uniqlo launched the Spring Parka Campaign in February with Fashion Map, an interactive website, iniviting users to meet 1000 Tokyo men and women wearing Uniqlo’s 1000 variations of the parka or hoodie. The site is connected with Graffiti Magazine’s Tokyo Graffiti publication. uniqlo.com/uniqlo1000 loads slowly, preparing 1000 profiles before launching a parka relay in which numbered participants pass a jacket from one part of the city to another, adding their own personal style in the process. Each of the segments of the relay is GPS tagged, linked with a Google map location and connected to Uniqlo’s online store catalogue. The pictures were taken by sending a crew into the streets of Tokyo to talk to 1000 people and ask them to wear a Uniqlo parka. The Fashion Map campaign includes pictures of typical Tokyo streets in fifteen different areas including the young, trendy Harajuku area, the Ginza shopping and entertainment district, Akihabara, famous for its electronics gadgets, and Tsukiji, one of the largest wholesale fish markets in the world. Browsing through the site takes visitors into the personal rooms of people who live in these streets. 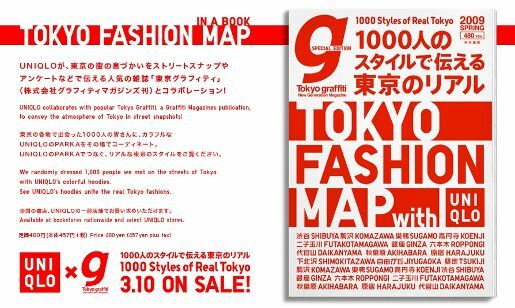 The Fashion Map was also distributed in the form of a magazine supplied to UNIQLO’s international stores to allow customers to see real Tokyo clothes for themselves. The Fashion Map campaign was developed at Dentsu Tokyo by executive creative director Koichi Sawada, planning director Keiichi Higuchi, art director Shinya Seino, copywriter Aki Kimura, agency producers Shinsaku Ogawa, Kai Hikiji, Sozo Kikuchi, account executive Osamu Kimura, and client supervisor Kenji Shiratsuchi. The web site was developed at Bascule by technical director Kampei Baba, director Megumi Kasuga, assistant designer Hironobu Ryo, Flash developers Takayuki Watanabe and Yoshikazu Iida. Filming was produced at Monster Ultra, Tokyo, by producer Takaharu Hatori and production manager Sho Yamashita. The book editor at Graffiti Magazines was Shunji Suzuki. Fast Retailing staff included executive planning director Kentaro Katsube, and client supervisors Aoi Matsumoto and Minako Suzuki.